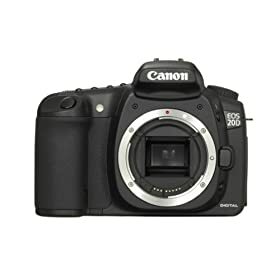 The Canon EOS 20D is an 8.2-megapixel semi-professional digital single-lens reflex camera, initially announced on August 19, 2004 at a recommended retail price of US$1,499. It is the successor of the EOS 10D, and is succeeded by the EOS 30D. Major changes over the 10D, aside from the new sensor and increased resolution, include almost instant power-on (0.2 seconds instead of the 10D’s 2.5 seconds), support for Hi-Speed USB 2.0 and support for the EF-S lens mount. Despite the resolution change, the sensor remains the same physical size as per its predecessor; all lenses still have an angle of view crop of 1.6 compared to the same focal length lens on 135 film. At the cost of a much noisier shutter than its predecessor shutter frame rate was improved, (5 frames per second), a larger 23 frame JPEG buffer but a smaller 6 frame RAW buffer, a new E-TTL II flash metering system, new DIGIC II image processor, a black and white mode as well as a brand-new nine-point autofocus system which is more responsive. The central cross-sensor has a high-precision mode which is activated by use of a lens of f/2.8 or faster. With 8-megapixel resolution, excellent image quality, reduced noise at high ISO settings, robust shooting performance, accurate AF, responsive Continuous AF, and improved ergonomics, there’s a lot to like about the 20D. Canon has certainly set a new benchmark for what an enthusiast dSLR should be, and the under-$1500 20D even encroaches on the performance envelope of the professional camera’s produced by some of Canon’s competitors! Despite a two megapixel increase in pixel count (and hence a reduction in photosite size) the EOS 20D manages to deliver lower noise with better sharpness at higher sensitivities than the EOS 10D. The Canon 20D is an excellent picture taking machine. Given its 8 Megapixel sensor, 5 frames / second shooting capability, instant turn-on, large buffer, extremely low noise, and excellent battery life, it’s hard not to give this camera an A. I might have even been tempted to give it an A+ if it weren’t for the missing ISO setting in the viewfinder and stupid mirror lock up sequence. The smaller dimmer viewfinder also knocks it down a peg. The noise behavior of the 20D is just amazing and matches that of the excellent Canon 1D Mark II. Despite the smaller pixels of the 20D, the noise levels have not increased over those of the 10D. In fact at high ISO settings, the 20D displays less noise than the 10D. I’ll be blunt: the Canon EOS-20D is the best reasonably priced digital SLR that I’ve tested. And by reasonably priced I meant under $2000. There’s so much to like about the 20D, I don’t know where to start. Photo quality is excellent, with photos having an ultra smooth look to them. Color and exposure were both accurate. Personally I’d crank the sharpness up another notch, but that’s just me. Noise levels are very low, even at ISO 1600 — try that with your fixed-lens camera! The camera performs superbly in every respect. Color is accurate, image noise very low, resolution excellent, and the camera is very responsive, both to the shutter button, and from shot to shot. Particularly impressive is the extent to which Canon managed to decrease high-ISO image noise, while at the same time going to a sensor layout with physically smaller pixels. The Canon 20D digital SLR camera is a fantastic tool for sports and action photographers who like to make large prints. The camera is geared toward professional photographers, but priced with consumers in mind. Not lost in the Canon EOS 20D upgrade is excellent image quality. Results from the 20D are impressive. All of the “Auto”s are excellent including Auto White Balance, Auto Exposure and as I mentioned already, Auto Focus.